Welcome to Day 4 of the 7 Day Closet Cleanout Challenge! If you missed the post that explains what the challenge is and how to get entered into the giveaway that's taking place at the end of the week, go back and read it HERE. Today we'll be sorting through all of our pants and shorts. This includes jeans and leggings, as well as dress pants! You can either hang or fold your pants, depending on personal preference. I hang my dress pants, and fold my jeans and shorts and stack them on a shelf. I hang everything in my closet on these hangers because in addition to being very slim and space saving, having all of your hangers match makes everything look so much more organized and uniform! I color coordinate my pants, the same way I do with my tops. Just remember, how you organize your closet is a personal decision that should make the most sense to YOU. There's no "right" or "wrong" way to do it! I can't wait to see all of your photos - before, during, or after the clean out process! 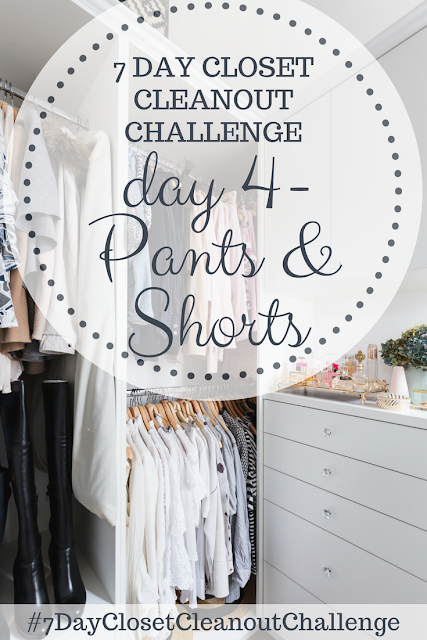 Just be sure to use the hashtag #7DayClosetCleanoutChallenge to be entered into the drawing for the $25 Target gift card that I'll be doing at the end of the week!